his music to reflect his new take on the fragility of life. At Rothbury Music Festival in 2008, pseudo political reggae-rocker Michael Franti displayed a knack for impressions, showcasing an impressive Kermit the Frog and Cookie Monster in the middle of his set. On their new album, The Sound of Sunshine the 44-year-old and his band Spearhead display a similar ability, alternately producing Sublime, U2, Jack Johnson and John Mayer rip-offs. This isn’t necessarily a bad thing. The first single and title track is a pleasant, bouncy affair, in which Franti channels Bradley Nowell’s sound while substituting optimism for melancholy. The anthemic “I’ll be Waiting” sounds like a more agreeable Bono. And the down-tempo “Gloria” is a pretty acoustic ballad, executed perfectly. Unfortunately, Franti does not show the same gift for songwriting as he does for sonic imitation. His lyrics are insubstantial and vague at best and contemptibly schmaltzy at worst. On the odious “Headphones” Franti asks his romantic partner to “Plug your headphones straight into my heart/ Because I want you to know what I’m talking about.” There’s nothing wrong with this sentiment, but the way that it’s expressed makes you want to plug your headphones into a jack that’s not playing a Michael Franti song. On the self-described “rock n roll with soul” jam “The Thing That Helps Me Get Through” Franti discusses his worldview: ““It’s a crazy world, a mixed up world, involving politics and the underworld.” But don’t worry. The subtle complexities of politics and the underworld won’t matter according to the chorus, which exclaims that “Nobody knows what you doin’ when you do to me, the thing that helps me get through.” Franti is well-known as a politically conscious musician and activist, and yet lyrics like these make him seem naïve, if not downright stupid. The Sound of Sunshine is a follow-up to the band’s 2008 effort All Rebel Rockers, their most popular album ever, which at its peak reached number 38 on the Billboard 200 pop charts. 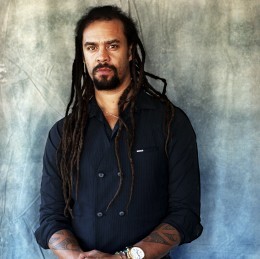 That success, along with the success of the hit single “Say Hey (I Love You),” has clearly influenced the new album, as most of the songs avoid the political themes that Franti has grappled with in the past and instead deal with enjoying, celebrating and loving life. However, this overwhelming optimism can also be attributed to Franti’s recent near-death experience, which occurred when his appendix ruptured on tour. After undergoing major surgery, Franti told Blender magazine that he was now more interested in writing songs that were inspiring to him that would help him get through the day. This positive outlook on life, combined with the newly redefined message of the band ensure that The Sound of Sunshine is a listenable, pleasant affair. Despite the lack of depth or substance, the album remains an optimistic, fun, 43 minute experience. These songs are really more about family and the vague overwhelming power of love than they are about anything important or even specific. But at the end of day, the music is likable and diverting. With The Sound of Sunshine Michael Franti and Spearhead have created a passable imitation of a good album, one that fans of lighthearted, bouncy reggae-rock are likely to enjoy.